ninemousestew.com » Animals. (Dead ones.) Yes. My brother sent me the link to a Scientific American article a few days ago about this new thing called The Brain Scoop. 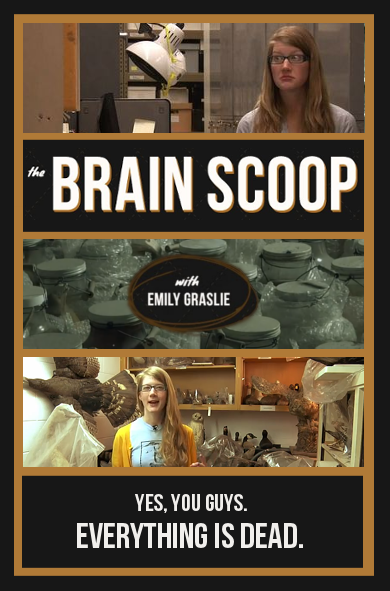 And I now have a new fabulous favorite person: Emily Graslie. She’s an artist turned zoologist/taxidermist/museum studies person. I love love love what she’s doing and I wanted to share it with you all. If you like science and animals I think you’ll love it too. It’s one of the best things I’ve seen in a while! Thanks for looking out for me, bro. Apparently you know me well. I think it’s pretty obvious, but in case it needs to be said, the image above is from her site.